Note: Any 3 day tour is available as 5 day tour. 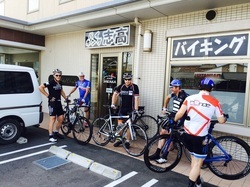 Tour price includes all meals, hotels and/or ryokans, experienced guide, epic cycling each day, fun on and off the bike. All tours are fully supported with support car and a mix of knowledgeable foreign and Japanese bilingual staff. Airport Shuttle service is also available.